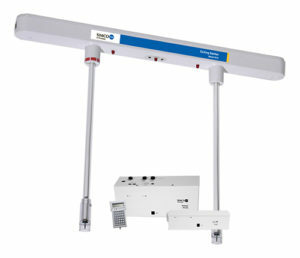 Full Room Ionization Systems offer 100% coverage for eliminating static charge on ALL the particles in an entire room. Simco-Ion’s family of ceiling emitters & digital controllers are designed to provide uniform ionization throughout a gowning room and the open areas of a cleanroom. Mounted onto the ceiling surface or inside a flush mount channel, our ceiling emitters maintain aesthetics without disrupting cleanroom laminar airflow or compromising the integrity of operating ISO class 1 cleanrooms. Moreover, our ceiling emitter room system has specifically proved its success in addressing Current Good Manufacturing Practices (CGMP) regarding contamination control by the FDA.